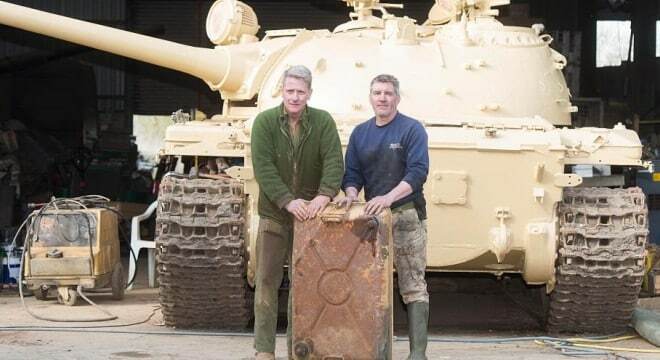 Nick Mead traded two vehicles worth $37K for an Iraqi tank from the old Saddam days and while restoring it found five gold bars hidden inside the metal monster. Mead runs Tanks A Lot, a service in Northamptonshire that owns some 150 vintage military vehicles that they rent out for film and “promotional publicity stunts, from garden parties, demonstrations, fates, shows and practical jokes.” As reported by The Sun, Mead swapped an old British Army lorry and an Abbot self-propelled gun worth £30,000 with an individual who was selling the Iraqi tank on eBay. Then, while stripping it down stumbled across five bars of bullion (and not the type you make soup with) inside the vehicle’s fuel tank. The collector thinks the gold could have been looted by Saddam’s troops in Kuwait in 1990 then the tank, a Chinese-made Type 69 (itself based on the Soviet T-54), was later captured by British forces and shipped back to the UK before it could be offloaded by the Iraqi version of Sgt. Oddball. In 1991, Iraq returned 3,216 gold bars stolen by Saddam’s troops during the seven-month occupation of Kuwait. The emirate is still trying to locate more than 400 artifacts, many priceless, stolen from the Kuwait National Museum.